garden of flowersgirl: "Same Old World...But New"
Last week, we had an appointment with Mason's optometrist and opthamologist. They both concurred that Mason needs glasses to hopefully correct some weakness in his eye muscles. 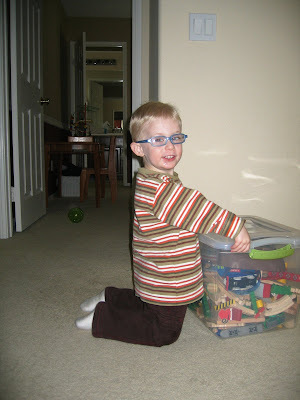 He's slightly far sighted and he'll probably wear corrective lenses through childhood. They don't seem to affect his ability to play...or make messes...although he does ask to take them off when we snuggle or wrestle. All in all, it's been a good addition. Mason calls his specs "sunglasses", which is accurate because, when he goes outside, the lenses transition into sunglasses. 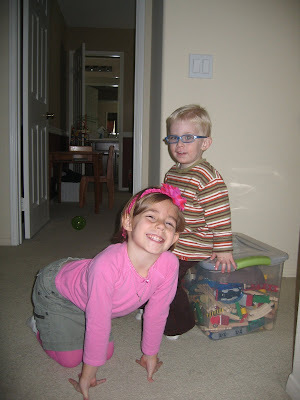 Madeline thinks her brother looks handsome in his new glasses.